Learn how to turn a series of individual JPEGs into a GIF with the Animation Factory and how to adjust the settings. Login to the Event Dashboard and create a new event or edit an existing one. Scroll down to the General Settings section of your event settings. Click the check box that says Create Animated GIFs from Watch Folder. Scroll down to the Animation Factory section of your event settings. In the "# of Photos To Wait For" field you can choose the number of photos to wait for before the software turns the images entering the watch folder into GIFs. In the Animation Speed field you can adjust speed in which the GIF is played back. It ranges from 0.1 seconds to 1 second or longer. Auto reverse GIF - If you enable this the images will play forward and then backwards generating a boomerang like effect. Show only GIFs on iPad (photos will not be displayed) - If this is enabled than only GIFs will be shown on the iPad. The original images will not be able to shared on the iPad, only the GIFs being generated from the watch folder. 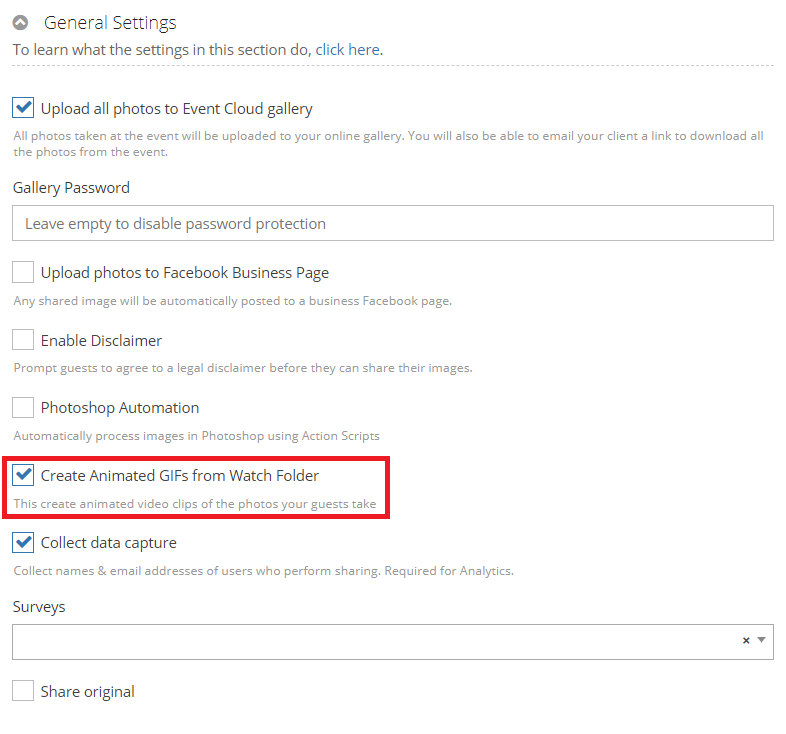 Upload GIFs to your Event Cloud gallery - When this is enabled it allows for the GIFs being generated from the Animation Factory to be uploaded to the online gallery. Scroll down to the bottom of your event and click on Update Event.